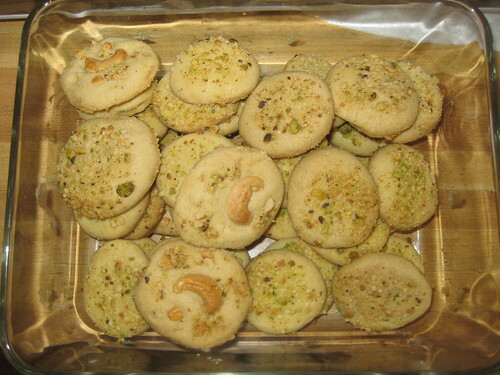 Nankhatai is rich,melt-in-your mouth cookies are a delicious tea-time treat.Or for that matter,a perfect anytime treat.Commonly known as nankhatai biscuits.These are easy and quick to make.All you need is flour,sugar,salt,baking soda and cardamom powder.Just toss everyting into a bowl,mix with your fingers,roll into balls,flatten bake.Super easy.This is my husband favorite.Today i am sharing this with u guys. Grease pr line baking shet with parchment paper or aluminum foil. In a bowl mix flour,baking soda,salt,cardamom powder mix well.Keep it aside. Melt the ghee or butter in a bowl. Now add the melted ghee and mix until it forms a smooth ball of dough . (Don't add water or milk,You may need to add an additional 1-2 tbsp of ghee if the dough looks too crumbly). Roll dough into balls and using your palms,slightly flatten each into a disc and arrange on cookie sheet. 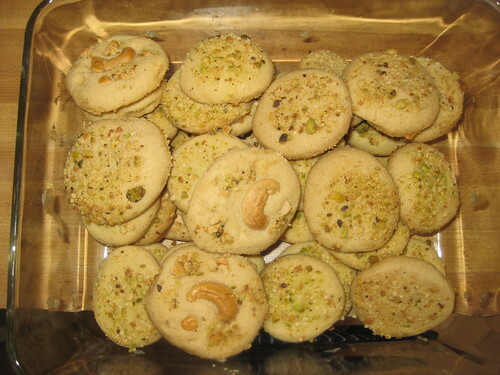 Press a piece of cashew,pistachio,almond on top.dip the dough in nuts powder on top. For nut powder almond and pistachio put in mix jar crush it 1 time. Back at 300 degrees F for 20 to 22 mins (until bottom of cookie turns light golden brown. Let them cool completely before storing them in an airtight container.